Huw Rhys James is Artistic Director of Musikwerkstaat, Vienna, and interviewed Param Vir on the occasion of the Austrian premiere of the double bill of operas, May 1999. Huw Rhys James: What are you musical roots? 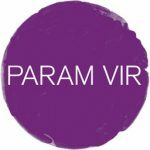 Param Vir: My mother was a singer of classical north Indian music in Delhi and there was consequently a lot of fine music in the ambiance into which I was born. I responded to this early stimulus by asking to learn the piano at the age of nine. Seeing the course of my life and the direction of my work, this was a fated choice and opened many new doors for me. I began to study harmony, counterpoint and composition with the German composer H. J. Koellreutter who was then resident in Delhi. He introduced me to the work of the Second Viennese School and the 12 tone row as a means of compositional unity when I was only 14 years old. Though I didn’t know about palindromes at that time and had really done no analysis, I wrote a song modeled on Webern’s Variations, Op. 27 (the score of which I was given as a birthday present at the age of 17), imitating whatever features I could work out for myself in that Webern piece! And believe it or not, because I went to a Catholic school, I was familiar with Plainsong too at the age of 12, plainsong which I profanely accompanied with chords on the harmonium – having been asked to do so by the priests, even though I was not a Catholic. And yes, the very first piece of music I got to know from your part of the world was the Blue Danube Waltz. When I was little and we went to the restaurants, that is the piece I would ask the band to play! Beethoven was a hugely emotional encounter – I had come across the Karajan recordings of the Symphonies whilst browsing in the library of the Goethe Institute. Ragas, Talas, Plainsong, Palestrina, Strauss, 12 Tone Rows and Greek Ecclesiastical Modes all meeting in the mind of a teenager in post-colonial Delhi? This was surely a fortuitous conjunction of influences! Years later, when I encountered Maxwell Davies in London, I was encouraged to pursue composition study. So, I then moved to London in 1984 with the intent to learn all I could about new music. My early years of study with Oliver Knussen (to 1988) helped expose me to a wide range of what was fine in twentieth century compositional practice. In recent years, I have also gained insight from discussions with the composers Jonathan Harvey and Randolph Coleman. I learnt, by analysis and absorption, to access the sound world of composers such as Maxwell Davies, Elliott Carter, Ligeti, Lutoslawski, Messiaen and Boulez. I would happily admit all of these as influences. But would equally well cite the effect on my work of the music of older masters, most especially Stravinsky, Schoenberg, Berg, Bartok and Ravel. Whilst in America, I taught advanced theory courses in the music of Berg, Messiaen and Carter, as these were my special technical and expressive concerns then. Current preoccupations include the procedures of Wagner (thematic relationships), and Sibelius (symphonic-transformational processes). These seminal composers are sure to leave their mark on my work in ways that will constitute enrichment and deepening of the quality of expression. HRJ: What is your relationship to Indian tradition and history, to Indian religion and to Indian music? We know that your work list includes compositions like Before Krishna and Brahma, Vishnu, Shiva. Do you consider yourself an Indian composer or a part of Indian culture? PV: The world today is an extraordinary meeting-point for divergent identities, cultures, languages, thought forms, and ideologies all jostling together in some amazing dance, the secret purpose of which is yet to be revealed. We are in the Hall of Mirrors – and can use the distorting mirrors of Otherness, of Difference, to see ourselves better, with greater self-knowledge. I have a complex identity, having had the privilege to sit astride two complementary cultures, South-Asian and European/American. The librettists of both my existing operas are British, and I was greatly stimulated by the cross-cultural roots of those collaborations. Hitherto, much of my early work drew its inspiration from Indian mythology and Asian historical sources. I viewed that focus to be an important part of my contribution to the world in which I live. My third opera Ion now explores an ancient Greek theatrical tradition (Euripides) at a period approximately contemporaneous with the Buddha (c. 500 BC), the subject of yet another opera Awakening that I hope to write. What common ground informs these two themes – apart from historical near-synchronicity? Is it the notion of self-knowledge that lies at the heart of both works as a central thesis? Do East and West meet here then? Maybe. Early training in History and Philosophy has equipped me to be at ease in a range of questions concerning self-knowledge, identity, meaning and value as have manifest in my theatrical work and life. No, I am not an Indian composer in any conventional sense – for I am a product of many cultures. When I relate to themes rooted in Indian traditional heritage, I am not drawing on a sense of national identity, but rather extending myself as a world musician, curious about things from another time and another space. HRJ: Are there composers whose music you reject? PV: I avoid music that comes purely out of posturing. Such and such music is good because it is minimal. Such and such is important because it is new-complexity, such and such because it is neo-tonal, or stochastic or whatever. None of these labels or postures actually mean very much, if the music itself doesn’t stand up on a purely experiential basis. Never before has so much misleading rhetoric surrounded modern music! And the music doesn’t become better just because it is attached to some political, musicological or spiritual ideal of how things should be. Those who write so-called ‘spiritual music’ are especially prone to this sleight of hand. What is essential is that the music be authentic. Music has its own syntax. Its validity lies in the ear of the listener, an ear albeit conditioned by education, cultural influences and prejudices. Music is good when it is marvellously made, when it has really musical ideas, rather than ideas about music. We want to hear amazing melodies, extraordinary harmonies, stunning orchestral and instrumental sonorities . . . All of these must reach our ears, not just appeal to our intellect or our politics. Each of these sensuous objects gets even better when the consciousness of the composer plumbs an emotive depth arising from a natural sensibility. But who is to be judge of that? And who can teach that? HRJ: Do your compositions express any political attitudes? PV: I don’t believe, as I have stated above, that music itself expresses political ideals: not in terms of musical syntax. Sometimes a composer can speak through musical metaphor; however that metaphor needs to be explicated and is hardly self-evident. But when allied with the theatre, music can be a powerful force for political and social comment. For this reason I believe one of my distinctive contributions lies in the field of opera. My interest in this stretches back to when I was sixteen years old and learnt of the Soviet invasion of Czechoslovakia in 1968 and the violence done to the Czech people. I hoped to write an opera on that subject one day. Since then, I have viewed theatre and music-theatre as a vehicle for engagement in large-scale political and social debate. Questions about ‘progress’ and societal reform, transformation of self, the use (or misuse) of technology, the nature of art and political freedom lie at the heart of what I wish to explore as an artist and human being. These concerns have led me, since my university years, to learn about the cultural and spiritual traditions of many different peoples (not just Indian) and to familiarise myself with a range of critical issues in contemporary history. HRJ: Are your works performed in India? PV: No. It is hard for western contemporary music to find a foothold in India. HRJ: When studying your music, the following things immediately strike one: on the one hand the wide range of instruments you call for, particularly percussion, the enormous technical difficulty of the instrumental parts and the wide range of effects you demand from each instrument. On the other hand, you display, particularly in Broken Strings, a remarkable talent for music which impresses through its simplicity, its melody and harmony. Does the idea of pushing an instrument to its expressive and technical limit have an innate value for you? PV: There is no intrinsic merit in pushing instruments to their technical limits, or playing court to that deadly aesthetic of neo-complexity where performers are required to violate the limits of their technique and play music that is as unpleasant to read as to listen to. I do like a large palette of sounds though, for I am very interested in instrumental colours and finding new means to blend them. I think the difficulties of a technical nature in my works arise from the intensity of the music; indeed I have often worked to simplify scores in revision and to iron out technical problems whenever possible. HRJ: One could say that in Broken Strings the music rebels against this complexity as displayed in Musil’s and Guttil’s first solos and that with each string that breaks, the music becomes rhythmically simpler, more tonal and more melodic. Was this development in the composition a conscious decision, or do you disagree with this description of Broken Strings? PV: I would agree that as Guttil makes his on-going journey through the breaking strings, his increasing simplicity of expression is a metaphor for the awakening of deeper dimensions within himself. But I would not wish to make the contentious assertion that complexity is a bad thing. There is a difference between complexity and the mangled hotch-potch that passes for it sometimes. The human body is a tremendously complex organism, and also very beautiful. Real complexity in music should be configured so that it sounds beautiful too. The opening of Berg’s Altenberg Lieder Op. 4 is a complex piece of interlocking orchestral motives that move and transform at various speeds. It is also marvellously luminous, sensuous and moving. Simplicity can co-exist with complexity. HRJ: You write that your first conception of the music is in the form of graphic depiction. How do you move from these drawings to the actual notes (pitch and rhythm)? PV: My compositional technique has crystallised into a specific process. I invariably start with my body and the energy, feeling and intuition I hold regarding the subject matter of the work to hand. This physical experience gives rise to an ‘energy-template’ in the form of a graphic drawing of the shape, form and timbre of the music. This visual sketch is elaborated into a rhythmic-template where I work out a detailed rhythmic design of the music, particularly the counterpoint of the orchestral idea in relation to the vocal writing. In the last stage I define the pitch material, especially creating an appropriate harmonic world that the work can inhabit in every detail, selecting pitches and chord sequences on the piano. Needless to say, these stages in the process of composing sometimes overlap or arise simultaneously. I write for acoustic instruments and unamplified voices. My work is intensely physical, and I compose with direct somatic energy, pencil on paper. HRJ: To what extent is your music a depiction of momentary events in the operas (Wind and Waves in Snatched, or the elephant’s tread in Broken Strings) or of the immediate emotions of the characters and to what extent is the development of the music controlled by an overall architectural structure? PV: Opera is an emotive and physical medium. It is important that characters and situations are sharply etched. Perhaps in that sense, I am not much of a classicist. Maybe I will aspire to a classical approach in opera one day. That has its own rewards. As for architecture, well this sounds a little like an imperative coming from a particular tradition of symphonic development! Should all music follow those conventions? It needs to be pointed out that the piece of music that more or less defines twentieth century music – I refer to Le Sacre – has no developmental architecture in it whatsoever. The design is composed of an extraordinary array of repetitive fragments and the music is through-composed. But there is architecture nevertheless. So in the broader sense of design I certainly hope my music has clarity, borne out by the fact that it seems to adhere together in the ear of the listener. In the double-bill I believe I achieved a harmonic and timbral unity, with each opera exploring very different terrain. However, traditional architecture of a developmental kind is also present – in the use of motives, especially in Snatched, and in the relationships between scenes. In Broken Strings the architecture speaks through the unfolding harmonic spectrum as each string breaks. The journey of Guttil is underpinned throughout by a clear harmonic and timbral strategy. In both works, the tempi, duration and textural qualities of each scene are mapped out within an overall design. HRJ: Is your sound world influenced by Indian music in any way? One thinks in particular of your use of percussion (and not just in the Interlude in Snatched by the Gods). PV: There are some rhythmic techniques drawn from north Indian music, in particular the use of taals and tihai structures (these are rhythmic cadences). But my use of taals is idiosyncratic and I have tried to extend the taal-technique in certain personal ways, such as the way the tihais expand and contract. I suppose my use of percussion comes out of an intense rhythmic sensibility which may or may not be drawn from my experiences as a tabla player – I studied the instrument for a few years when I was a university student. HRJ: Is your writing for voice influenced by Indian music? PV: Vocal music is fundamental to north Indian classical music. I suppose that my early exposure to it has brought its own imprints. I am aware of the diversity and fluency of the voice, the use of meend (glissandi) and gamak (gut), the extraordinary flights of coloratura. I have been consciously seeking to extend the range of vocal writing, and my double-bill is an early example of that exploration. HRJ: The vocal writing is extremely exact and complex, using subdivided quintuplets or septuplets and ties over the beats with accents to show the correct emphasis. Why do you set the text in this way rather than integrating it into the basic beat structure of the 3/4 or 4/4 bar? PV: Well, there are countless instances of the music being organised in 4/4 bars, with rhythmic motives in the orchestra and voice superimposed over that (arbitrary metrical) scheme. But when the music articulates a strong metrical pattern and the dominant rhythms can be clearly felt to be in 5/8 or 7/8, then I like to give the orchestra that meter, and pace the vocal line against it. It is very much a question of how I would like the performer to experience the rhythm in the body. Rewriting such a rhythm in 4/4 and using ties does not produce the same experience. We have been bludgeoned into thinking in 4/4 – 95 % of music we hear is in that meter, especially in the commercial domain. Integrating everything into a standard 4/4/ meter distorts too the free flow of improvisatory rhythm that one may sometimes want to achieve. Rhythm is a rich and diverse phenomenon; for me thinking in fives and sevens was natural to the way I heard rhythm even as a boy. Another gift of Indian classical music? In many other cultures too rhythm displays this diversity. In the western conservatoire however, perhaps we need to address this as an issue within the pedagogy of aural training and performance. Musil: For half an instrument this —- music is remarkable! Guttil: Two middle —– strings alone. Some song can still be — sung. Why do you set the text in this way? PV: Silences are part of the way in which we experience sound. When we speak, we often disrupt/punctuate/emphasize/edit what we say by inserting silences, in all sorts of odd places. Sometimes we just need time to choose our words, to retrieve a thought, originate a response, inflect a meaning. These moments of silence, whether fleeting gaps or long pauses, happen in the middles of sentences too, not just conveniently at the ends! However when we set text to music we often tend to ignore this feature of speech. By using the silences you mentioned, I tried to accommodate that quality and create greater characterisation. I don’t often do this though – it is more usual in recitative. HRJ: Your music shows a remarkable variety of ways of organizing music and text, from highly organized rhythmic repetition to free repetition of motives ‘senza misura’. Do you consider this diversity important for your ability to communicate with the audience? How important is it to you that the audience responds emotionally to your works, how important that the operas lead people to reflect intellectually on what they have seen and heard? How do you see the relationship between these two ways of experiencing a work of theatre? PV: I did try to create a rich palette of possibilities; it was also essential to the success of the double-bill that the music of each opera was distinctive. This meant consciously creating very different sound worlds for each to inhabit. In Broken Strings especially, there was a clear pre-compositional process that set out the limits of the stylised language I wanted to cast the work in. It is important to me that the audience has an emotional response – but I hope too that the works lead to introspection and inward extension. The two responses can co-exist, and there will be an intellectual response if the work has explored ideas successfully. Both operas deal with pilgrimage. In the one it all goes horribly wrong, and in the other the sacred journey is presented almost dialectically, with the shadow (Musil) present throughout. Both works deal with Shadow in a broad sense. If there is anything to reflect, it is perhaps the proposition that shadow is essential to our understanding of life. The failure to deal with, and acknowledge, shadow leads to holocausts, wars and ethnic cleansing.